The emerging field of computational modeling provides researchers the tools they need to mine, curate, and process vast amounts of electronic data. The insights they are uncovering have the potential to shape every aspect of our lives. Tens of millions of americans walk around with medical devices implanted in their bodies, from artificial joints and heart defibrillators to silicone and stents. But while such devices can give patients a new lease on life, they come with significant risk, including dangerous reactions like inflammation or infection. To improve the outlook, researchers increasingly are turning to a new, highly complex source: computational modeling. Blending mathematics, physics, and computer science, computational modeling expedites research by allowing scientists to conduct thousands of simulated experiments by computer. The emerging field is driving significant progress because it provides a way to mine and curate the vast amounts of electronic data now being collected and stored thanks to advances in technology. 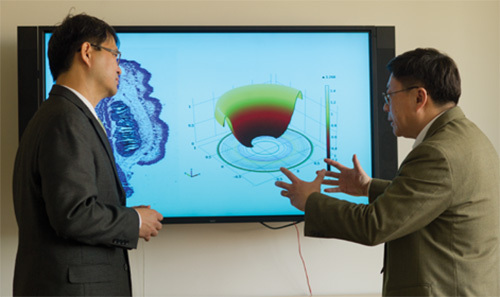 The work of Professors Liping Tang (bioengineering) and Jianzhong Su (mathematics) on medical implants demonstrates the field’s potential as a research tool. Using sophisticated mathematical models, the professors have developed a computer simulation that can predict the biocompatibility of the devices and identify when and how to best treat any resulting foreign body reactions. The duo’s project and others like it received a big boost in 2012 when the White House announced the Big Data Research and Development Initiative, a $200 million investment in tools to handle the huge volumes of digital data needed to spur science and engineering discoveries. Because these data sets are so massive and abstruse, scientists are developing special algorithms to process the information. At UT Arlington, dozens of researchers are employing simulations to advance their knowledge of everything from business plans to supernovas. But health care is where the effects can most clearly be seen. In addition to Drs. Tang and Su’s work on medical devices, there are projects using computational modeling to predict when epileptic seizures will occur; to help physicians personalize patient treatment and identify risks that can lead to hospital readmission; and to locate leaks in existing health care data to ensure patients’ privacy. Medical devices such as joint replacements and prosthetics represent a growing sector of health care that generates roughly $85 billion annually in the United States alone. Yet almost all implants trigger some degree of foreign body reaction, which can cause severe pain, swelling, infection, and the formation of fibrotic capsules in surrounding tissue. All threaten a device’s effectiveness. The severity of the reaction is governed in large part by the behavior of microphages, cells that can rapidly change in response to signals from the body and its immune system and play a significant role in wound healing. To study the issue, Tang, Su, and their team divided microphages into three types based on their functions, then developed a series of mathematical equations based on the kinetic characteristics of the microphages and fibroblasts, or connective tissue. Because little is known about foreign body reactions, the researchers instead inspected the wound healing process. Results were consistent with biological models in laboratory tests, so the team is now building a 3-D model. Their work, funded by the National Institutes of Health, was published in the Journal of Immunological Methods. Worldwide, about 60 million people have epilepsy, a neurological disorder that causes seizures—essentially a sudden surge of electrical activity in the brain. And while the condition is manageable, epileptics have little to no warning when a seizure is about to occur, putting them at great risk. 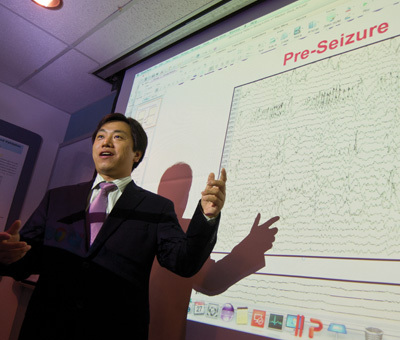 To remedy the problem, Shouyi Wang, an assistant professor of industrial and manufacturing systems engineering, has developed a computer model that more accurately predicts when an epileptic seizure will occur based on a patient’s personalized medical information. Partnering with scientists at Rutgers University and the University of Florida, Wang used electroencephalography (EEG) readings from 10 individuals to devise the model. Early indications show a 70 percent accuracy rate. Data is collected through a cap embedded with EEG wires, which delivers a 30-minute warning before a seizure is likely to occur. The model uses an adaptive learning framework, meaning it is capable of achieving a more accurate prediction as it collects more EEG information from the user. The framework could eventually be used to predict life-threatening episodes of other diseases. To provide high-quality health care, doctors must have the best, most up-to-date information. Heng Huang, an associate professor of computer science and engineering, is leading a new NSF initiative to mine electronic medical records to help health care providers personalize patient treatment, predict health care needs, and identify risks that can lead to readmission. In collaboration with UT Southwestern Medical Center and Southern Methodist University, Dr. Huang is creating a series of equations to analyze patient records from the Parkland Hospital ER in Dallas and create risk-based models that will help doctors tailor treatments. Predicting possible readmission rates for heart failure patients is a top priority, as timing is key to survival. The research also could help health care professionals find a balance between patient hospital stays and insurance companies’ needs to control costs. In a related project, he and his team are developing software to identify leaks in existing health care data and shore up privacy controls for electronic records, thus keeping the patients’ personal information secure. “We want to prevent any leaks from occurring, but we also need to have a way to detect any that have already occurred,” Huang says. He believes that through scientific, fact-based predictions, computational modeling and simulation has the potential to vastly improve health care. Still, for all of its uses in health care research, computational modeling has dozens more applications in other, unrelated fields. Physics Professor Kaushik De, for example, is using the tool to develop a universal version of Panda, a workload management system built to process huge volumes of data from experiments at the Large Hadron Collider in Geneva, Switzerland. Two other physics researchers—Carola Ellinger and Sangwook Park—are employing a complex computer code to study supernovas, while a pair of psychology faculty are trying to quantify group creativity (see Innovation by the Numbers). And engineers Bill Corley and Jay Rosenberger have patented an innovative method that can obtain optimal decisions for a broad class of real-world problems not previously solvable in the business and science sectors.